Los Angeles Limo Service, Car Service, and More! Whether you’re flying out or returning home, Masters Limousine is the top LAX airport limo in Los Angeles. On-demand chauffeurs, executive services with late model, well maintained limousines, black cars, SUVs and luxury vehicles, and global access help us make transportation to LAX private and hassle-free. Why drive to Los Angeles International Airport when a car service with Masters Limousine can get you there in style? Our LAX airport limos are waiting! It doesn’t matter whether you need a limo to LAX or a car service to your hotel, Masters Limousine can get you there. Our Las Angeles car services can be used for everything from corporate transportation from the airport to a night out on the town in L.A. Reserve a LAX limo service today! With over 20 years of luxury transportation experience, Masters Limousine caters to clients no just in L.A., but worldwide. Not only does Masters Limousine provide LAX limo service throughout Los Angeles, but through our partnerships in over 550 cities worldwide we also offer global limousine service that cover all your travel needs. With Masters Limousine you only need to book one reservation and we will handle the rest. 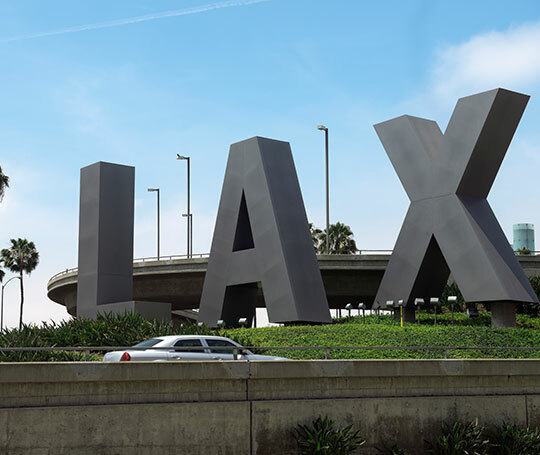 We provide airport car services from LAX to anywhere in the city: downtown LA, Los Feliz, Silver Lake, Echo Park and even limo services from LAX to Disneyland. Our door-to-door private transfer services can deliver you to the Los Angeles Convention Center, any LA area hotel, or any place you want to be. This is a great way to get from LAX to your hotel or office building in Los Angeles. Our prompt and courteous chauffeurs solidify our stance as the premier limo service in Los Angeles and Southern California, embodying our values of reliable and professional service. With late-model luxury vehicles and private transportation, we offer an unparalleled travel experience to LAX and beyond. Our Los Angeles airport transportation includes luxury sedans, town cars, SUVs, passenger vans, and even green hybrid services. Masters Limousine guarantees on-time service, point-to-point transportation, 24-hour availability and complete discretion for clients. In addition to our competitive travel rates, we offer discounts, group account rates and VIP services. Masters Limousine also provides private hourly charters, executive protection services, and celebrity transportation. That’s what makes Masters Limousine among the best when it comes to a LAX airport limo in Southern California. We offer incredible LAX car services & airport limos to anywhere in the Los Angeles area, including: Santa Monica, Beverly Hills, Glendale, Pasadena, Orange County, and more! Whether you’re headed to L.A. for business or pleasure, we can provide any type of transportation that you need. Masters Limousine provides car services to the Los Angeles Convention Center, Disneyland Resorts, your hotel, or boardroom: great options for executive travelers or families. Book a reservation online, call to speak to one of our representatives or explore our mobile app for more information. Masters Limousine wishes to provide you with the best traveling experience at LAX – Los Angeles International Airport through quality service and luxury transportation. Book your LAX car service today!